One of the toughest parts of trying to slim down is choosing the right foods to eat and the right number of calories to lose weight. You obviously know that fries and a burger are not the best choice for you; but you don’t know what is! So here are some nutritionists’ tips to help you think of delicious lunch meal ideas which will also help you lose weight. You need to have about 20-30 grams of protein for lunch, which will constitute about 17 to 25% of your lunch calories. There is a benefit to having a healthy dose of midday protein- it helps prevent the grogginess you feel after a lunch heavy with carbs. Moreover, the increased protein makes you feel satisfied after lunch so that you are less likely to reach for sugary snacks. Aim to include at least 8 grams of fiber, which constitutes about 30% of your daily recommended total of 25 grams of fiber a day. Make sure you include fiber-rich carbohydrates like starchy veggies, fruits and whole grains, and some fiber-containing fats like nuts and seeds to get the fiber for your meal. Your lunch should typically be between 400-450 calories if you want to lose weight. However if you are working out and want to maintain your weight, you can afford a lunch of 500 calories. You definitely need carbs in the afternoon. 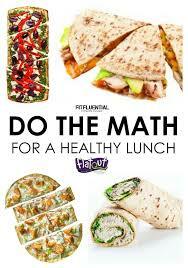 It should be about 50- 65 grams or about 45 to 55% of your lunch calories. You need carbs as it gives your brain and body energy and skimping on it may make you feel sluggish later on. Even overdoing it will make you sluggish, which is why you need to stick to eating only 50-65 grams of carbs. However do avoid refined carbs like foods made from white flour and white sugar and instead, eat whole grains, breads and pasta, fruits and starchy veggies. A healthy lunch is one with four grams or less of sugar. However if you like foods containing natural sugars like grapes, dried cranberries, sweet potato or natural sweeteners like honey or maple salad in salads, aim to have less than 20 grams of sugar. Be careful; some products like sandwich bread have hidden sugars in it. Read labels and choose those without any added sugars. Add some healthy fats to your lunch to make it more satisfying. Some examples are nuts, seeds, olives and avocado which can also help beat sugar cravings later. Just include 13 to 18grams of it, which makes 30-35% of your total lunch calories. Your lunch should be eaten about one to three hours after your morning snack. So if you have your breakfast at about 8.00 and your snack at about 10.30 am, have lunch around 12.30. If you are one of those who forget to eat because of your work, you can always set an alarm on your phone or computer to remind you! Use these 7 tips to create the best lunch meal ideas based on the number of calories to lose weight. These meal ideas don’t emphasize on taste, but will definitely help you with your weight loss endeavors.